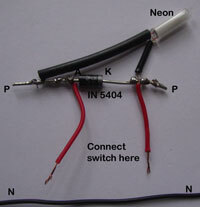 Soldering may sometimes make nuisance because the Iron will be either too hot or cold. If it is switched on continuously, it becomes too hot, wasting power and the bit gradually erodes. If it is switched off during a work, it takes time to become hot. So what is the solution to solve this problem? Do it, your Soldering Iron will always be ready in its two heat conditions. Simple, see how the trick works.